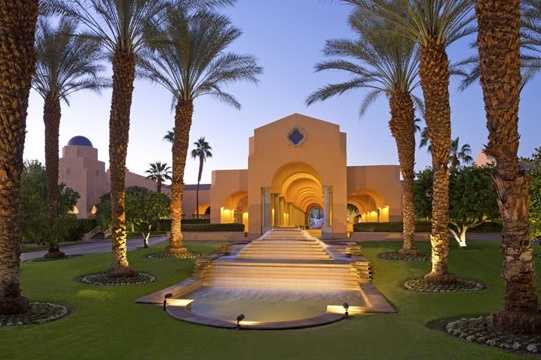 The location of Innovations in Testing 2015 is not new -- ATP has been returning to the Westin Mission Hills in the Palm Springs/Rancho Mirage area of California as a favorite west coast location for a number of years. But that doesn't mean the Conference will look and feel the same every time! For starters, attendees will find that the ballrooms usually used by the exhibitors and the general sessions have been swapped. As ATP's head meeting planner Michelle Issing, President of Designing Events explained, "The conference has grown so much that we need the larger ball room to accommodate the attendance at the general sessions...this is really a good problem to have." The result will be slightly smaller booth space for sponsors - but higher traffic in the exhibit areas -- and a roomier space for the popular general sessions. Another rather "old" tradition for ATP has been brought back, thanks to General Dynamics Information Systems -- which is the annual Golf Tournament. ATP Board Member Andre Allen noted that "the idea of having a golf tournament at ATP is not a new idea, we used to do it many years ago, but it lapsed due to lack of any one sponsor willing to take up the responsibility." Allen said it seemed like a loss since the Innovations Conference has been located on such outstanding golf courses -- and golf is a sport that truly lends itself to networking. "Last year the leadership team at General Dynamics decided to reinvigorate the tradition," said Mike Tancredi, Senior Marketing Strategist at GDIT. Tancredi was pleased by last year's pre-conference tournament turnout at the Westin Kierland resort in Scottsdale. Tancredi recounted that as a testament to the caliber of the course, "the ATP golfers found themselves surrounded by secret service on the first day of their outing" as Vice President Joe Biden had chosen the same date, and course, for his personal golf outing. Tancredi did not promise a reappearance of any celebrities at the 2015 golf outing -- but he did promise a good time, and a quality networking event, for any Innovations attendees who want to join the tournament event. Information on the Innovations golf outing is available on the conference website. Another new feature of the Conference, which was introduced by E-ATP at its recent conference in Budapest, is the Hackathon. This "not-for-geeks-only" event will feature teams challenging each other, in a collegial environment, to create high level certification programs and business plans. "This was a fun, fast-paced event that was very popular at the E-ATP Conference," reported this year's Innovations Chair Erwin van Schaffelaar of Cito. "The session received such high ratings from the European audience that we decided to bring it to the U.S. Conference." "This event shines a positive light on program development skills instead of the often used 'hacking' associated with malicious and illegal activities," noted ATP Counsel Alan Thiemann. He also indicated that all outcomes of the Hackathon will be in the public domain, stating that, "no one will be able to patent anything developed at this event." More information about the full program at Innovations 2015 is online at the conference website.